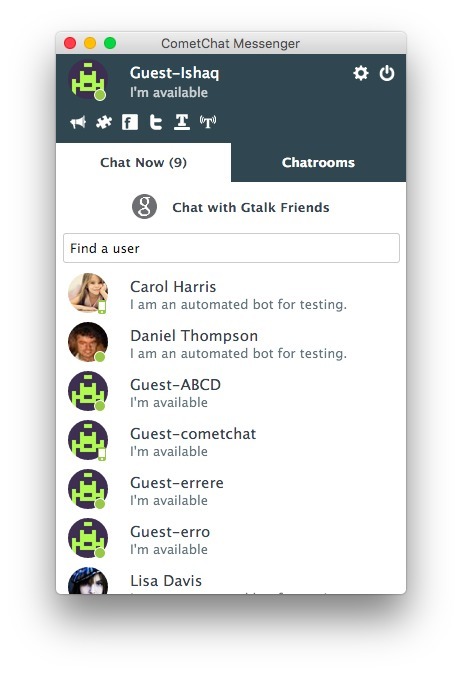 Chat with users on your website from your desktop. Is there a better alternative to CometChat Desktop Messenger? Is CometChat Desktop Messenger really the best app in Chat category? Will CometChat Desktop Messenger work good on macOS 10.13.4? CometChat Desktop Messenger enables users to chat directly from the desktop using the white-labelled Mac desktop app. Note: While MacUpdate Desktop and Finder report the version number as 2564.82, the dev states that it is 1.0.0. CometChat Desktop Messenger needs a review. Be the first to review this app and get the discussion started! CometChat Desktop Messenger needs a rating. Be the first to rate this app and get the discussion started!